Grapefruit are usually propagated by grafting to ensure that new trees bear true to the original variety. 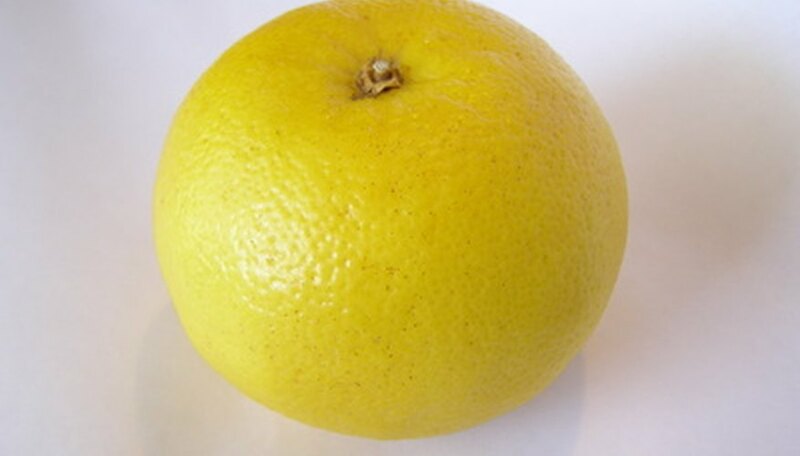 Grapefruit is a relatively new addition to the citrus family. It was first described and grown in around 1750 on the island of Barbados. In the mid-20th century, the genealogy of the grapefruit was found to be an accidental cross between a pomelo and an orange. Although you can grow grapefruit trees from seed that produce fruit, the fruit may be quite different from the fruit that produced the seed. Therefore, grafting is a more reliable method of grapefruit propagation. Make a long sloping cut on the bottom of the scion. The cut should be between 1 to 2 1/2 inches long. Make a matching cut on the rootstock. Cut a tongue by slicing down from the middle of the horizontal cut to the start of the cut. This cut should be straight down though the center of the scion to make a tongue to increase contact with the rootstock when slipped together. Make a matching cut on the rootstock to make a tongue that matches up with the scion's tongue. Slip the tongue on the scion into the tongue on the rootstock. Wrap the grafted area with grafting tape to secure the joint. Cover the tape and joint with grafting compound. Remove the tape and grafting compound when the scion begins growing.